Mark Manlapaz, a 36-year-old man of Filipino descent, died Friday, June 29, after he was stabbed in the 3500 block of Pomona Boulevard in Pomona, according to Los Angeles County sheriff’s investigators. Manlapaz was working one of two full-time jobs, as a security officer for Cal Poly Pomona University, when he was stabbed and his throat was slashed around 4:30 p.m., according to Sgt. Howard Cooper. Investigators found Manlapaz in the front seat of his work truck in a parking lot on the south side of Pomona Boulevard, just south of West Temple Avenue, Cooper said. A film was being shot in the area, Cooper said, and Manlapaz was monitoring traffic to keep unwanted people from coming on the set. Manlapaz was pronounced dead at the scene, Cooper said. An autopsy is still pending. About 20 minutes after Manlapaz was found, Pomona Police and campus police received reports about a man acting erratically near University Drive and Temple Avenue, about four blocks from where Manlapaz was slain. The suspect, described only as a black man, was shot by Pomona Police and campus security officers around 4:55 p.m. and pronounced dead at the scene, Corina said. Investigators found a knife near the man’s body. The sheriff’s Homicide Bureau is investigating the two deaths and put a security hold on both cases, meaning the Los Angeles County coroner’s office can’t release any information. Cooper said investigators are waiting until after the autopsy to identify the man who was shot by officers, and any details about where he worked or whether he knew Manlapaz. 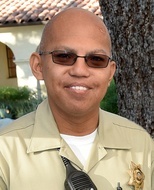 Manlapaz worked 16 years with the university’s security team. For the past three years, he also had worked as a park ranger for the city of Claremont, overseeing the Claremont Hills Wilderness Park, city spokeswoman Bevin Handel said. Manlapaz supervised other rangers at the park, which logged thousands of visitors every week, and was there to open and close the park every day, Handel said. Manlapaz was not married and lived in Ontario, she said. His parents and other family lived in Victorville. In conversations with people around the city, Handel said she keeps hearing similar things about Manlapaz’s kindness, devotion to his family and hard work. Mark, you and I were really close back in our high school days. Your mom considered me as her own. I still can't believe this has happened. I wish I stayed in contact with you after high school. You were a nice and you even helped me through my suicidal days and days of depression. I will not forget your laugh nor your gentleness. You will be deeply missed. — Antuan Harris July 18, 2018 at 1:51 a.m.